Donald Trump is not a candidate for president. 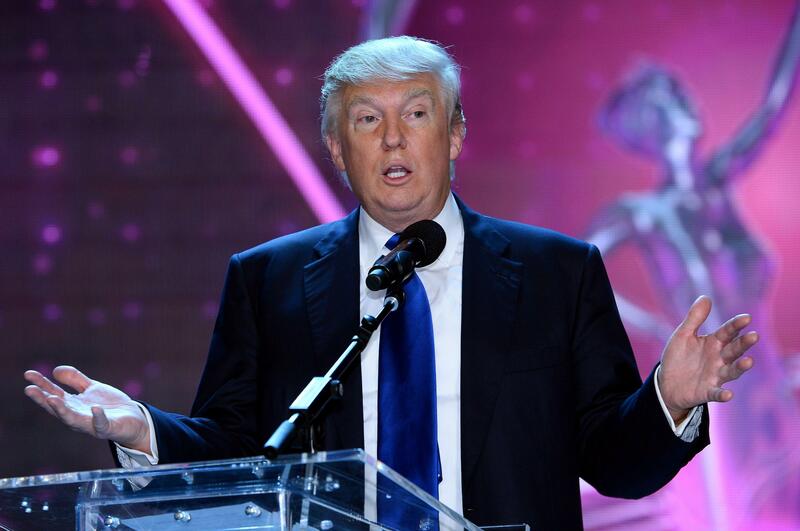 Donald Trump speaks onstage at the 2013 Miss USA pageant, a more fitting forum for his views than a presidential campaign trail. If I’m visiting a state for a political story, and I have the time, I try to stop by a Sunday church service. I did that last year in New Mexico, during “Pulpit Freedom” Sunday, and I did it yesterday in Des Moines. My church of choice was Fort Des Moines Church of Christ, which made news last year when the pastor placed the words “Gay is Not Okay” outside the building. Didn’t agree with that, but I’m pretty into our Lord and Savior, and I’m interested in hearing what actual churchgoers—rare in my D.C. circles—are discussing in a given week. This week’s sermon focused on James 5, which really sounds best in the King James (no relation) translation. Go to now, ye rich men, weep and howl for your miseries that shall come upon you. Your riches are corrupted, and your garments are motheaten. Your gold and silver is cankered; and the rust of them shall be a witness against you, and shall eat your flesh as it were fire. Ye have heaped treasure together for the last days. Behold, the hire of the labourers who have reaped down your fields, which is of you kept back by fraud, crieth: and the cries of them which have reaped are entered into the ears of the Lord of sabaoth. Ye have lived in pleasure on the earth, and been wanton; ye have nourished your hearts, as in a day of slaughter. Ye have condemned and killed the just; and he doth not resist you. Be patient therefore, brethren, unto the coming of the Lord. Behold, the husbandman waiteth for the precious fruit of the earth, and hath long patience for it, until he receive the early and latter rain. The gist of the sermon: You should probably listen to James, hoard less, and give more to charity. But at one point, the Rev. Mike Demastus went on a tangent about how he’d heard Donald Trump appeared at the Family Leadership Summit the day before. What did Trump have to do with family values? Was he only getting attention because was rich? Yep! After the sermon I noticed Twitter discussing an interview Trump had done with ABC News. He closed out the summit with a rambling speech notable mostly for his Monday-morning quarterbacking about how bad the Romney campaign was. (This analysis included attributing the “celebrity” ad, which he thought was actually good for Obama, to Romney. That 2008 spot was designed by John McCain’s campaign.) I didn’t include it in my piece about the event, because Trump isn’t actually running for president. But Trump made himself available for on-camera interviews, and people bit, including a local network (which made its entire FLS story about Trump) and ABC News. That interview started the right way. Jonathan Karl, who interviewed Trump from Iowa, introduced the segment by saying that the incoherent, self-promoting tycoon “has some people out here raising their eyebrows; others, just rolling their eyes.” Indeed! On camera, Trump proceeded to embarass himself at Karl’s prodding. This wasn’t true. Trump didn’t file any financial disclosures in 2011. His aides told people that he was worth around $7 billion, which was $4.3 billion more than Forbes estimated for him, and he told Karl he was now worth “probably over $10 billion.” But he never filed the applications, and—while we all appreciate Karl making sport of Trump’s idiocy—he didn’t get called on it. *The obvious difference between Cruz’s citizenship and Obama’s is that Cruz was born in Canada, while Obama was born in the United States. Both are natural-born citizens, but so-far-tepid “Cruz birtherism” fails to do justice to how crazy real birtherism was—it assumed that Obama’s parents had faked birth certificates and newspaper announcements and that Obama Sr. bestowed British citizenship on Obama and that the future president had relinquished his citizenship when he lived in Indonesia. **Of course, Trump was invited to the summit, and that was a controversy! But a story about the Family Leader, its attempt to become a kingmaker group, and the possibility of Bob Vander Plaats’ organization supplanting the Ames Straw Poll is not a story about Trump’s politics.